125mm treads provide maximum safety and comfort over prolonged periods. Aluminium construction - light and handy. Tall safety rail provides added security when working at height. EN131 compliant, TUV tested and GS approved. Large tool tray with integrated bucket hooks. 6 tread and above have leg retention straps. Choice of five platform heights. 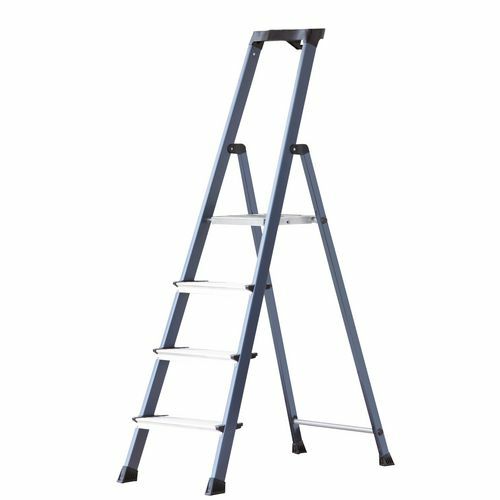 Balancing on normal tread ladders or steps can be very challenging, as the user will use more concentration and energy standing on the ladder, than on the task they are trying to perform. The extra deep tread aluminium steps from Slingsby offer larger surfaces, at 125mm deep, to stand on while working at height providing excellent safety and comfort over prolonged periods. A tall safety rail provides added security when working at height and the steps with six treads and above have leg retention straps for added safety. The aluminium construction makes the steps light and handy when carrying. They are manufactured to EN131, trade use and GS approved, as well as having a slip resistant foot caps and plate. These steps are available in a choice of five platform heights; 850, 1050, 1250, 1500 or 1750mm and they have a large tool tray with integrated bucket hooks. Our extra deep tread aluminium steps are a convenient way to work at height, offering great support to the user and a place for them to hold their equipment. They come with a 12 month guarantee and FREE UK Delivery.